Divyashakti Granites Ltd. is in portfolio of Subramanian P. He is one of the top investors in India. It is in Granite sector. As per the Company website it processes quality raw blocks from not only India but also from Brazil, Norway, Finland, Ukraine, Saudi Arabia, South Africa, Angola, Madagascar & other African countries etc. The Company’s USP is in its capability to produce exotic stones in exquisite colors, textures and finishes. 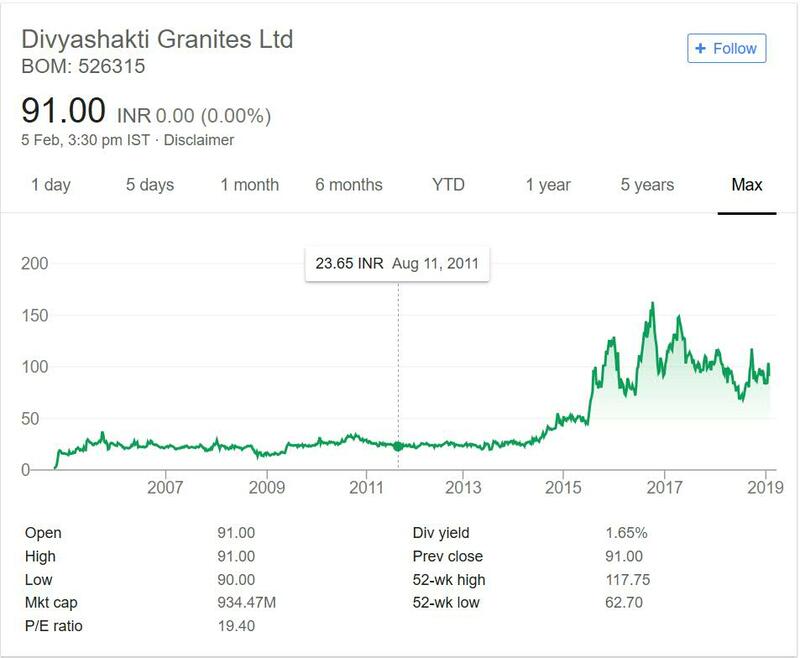 After making a mark on the US market, Divyashakti Granites plans to expand its operational ambit to countries like Canada, France etc. It has factory in Hyderabad. It has installed capacity to process about 375,000 sq. mts. of granite slabs per annum. It exports more than 300,000 sq. mts of granite to its eight warehouses in the US and several destinations in Europe and Middle East Asia. The long term price performance of the Company looks interesting. The period from 2003 to 2014 is story of consolidation. If you see yearly chart for these years the stock price was range bound. It never fell too low or rose two high. It remained near to 20 30 levels for all these years. Note before this long consolidation the stock did have huge jump in year 2003 giving investors 15 odd times return in very short period of time. After this kind of return consolidation happens but it did took very long consolidation time. Between year 2003 and today’s price company has given 90 times return to investors. If you see from year 2014 to 2018 it has given roughly 4 times return. The dividend yield is also good at current market price. This company has been a rewarding investment for Investors. It is still a Penny company despite so huge returns over the years. Granites are becoming popular in India and abroad. If you see Company has major focus on Exports. It exports majority of its production. The exchange rate will help the Company as it helps IT and Pharma. This is very important aspect of business model. US is main focus market for the Company. But it is trying to expand its foot print in other countries like Europe continent and Canada etc. India is also emerging as major consumer for Granite products with time. Company has given stellar returns in past 16 years or so. It has potential to repeat the same in future. I will be tracking this Company in my stock watch list.In case you are interested then you can track the company by adding it to your stock watch list. That way you can keep close eye on the Company.